The youngest of eight children in a family that squeezed out a living by picking and packing Ventura County’s rich harvest, Jesus “Chuy” Loza ’93 worked harder every year and had fewer hours left over for study. By age 15 he was on a summer picking crew for the sprawling Limoneira Ranch in Santa Paula, one of the nation’s largest growers of citrus and avocados. As a sophomore at Santa Paula High School, he was putting in 20-plus hours a week in Limoneira’s accounting department, and soon after graduation, he was working full time in accounting and marketing, learning the basics of business administration on the job. So maybe it’s no great wonder that he used his skills 11 years ago to co-found a booming agricultural enterprise, Freska Produce, which is now North America’s largest supplier of mangoes. Also a leader in mango markets in Australia, New Zealand and Japan, the Oxnard-based company generates $70 million in annual sales and is growing 10 to 15 percent a year. Considering his heavy work schedule during college, maybe the most remarkable thing about Loza’s story is that he never doubted he’d earn a degree. His parents didn’t let him or his siblings doubt it. The family came to work for and live at the Limoneira Ranch when Loza was just 4. His father worked maintenance, while his mother worked in Limoneira’s bustling packinghouse. Neither of his parents had much formal education. Nevertheless, Loza said, they were heavily involved in the schools their children attended. His mother joined various school committees, and one year filled a vacant seat on a local school board, despite her limited English skills. And his father often served as the regional representative to statewide migrant education conferences. Loza enrolled at Cal State Northridge when he graduated high school, but he worried that it would take too long to earn his degree given his full-time job at Limoneira and state budget cuts that limited course offerings. That’s how he landed at Cal Lutheran, enrolling in the Bachelor’s Degree for Professionals program. Designed for working adults, the accelerated program allowed Loza to do coursework in manageable chunks, and earn his degree in much less time. Today, Loza’s world is getting larger all the time. The company gets its mangoes from Mexico, Guatemala, Ecuador, Peru and Brazil, and Loza frequently travels the globe to meet with suppliers and customers. 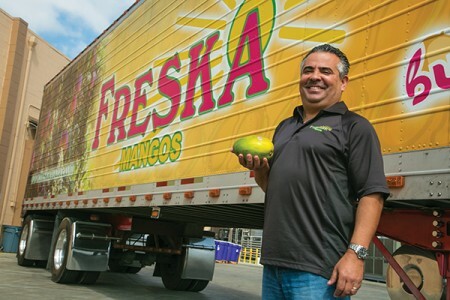 Freska also is broadening its horizons, diving into the rapidly expanding avocado sales and distribution business. From his vantage point, Loza sees a bright future for both products, citing growing demand in an American market that is yet to be fully tapped. Even while he tends to worldwide business ventures, he has sunk deep roots locally and takes every opportunity to give back to a community – whether it’s financing the local Fourth of July fireworks show or supporting youth sports programs – that has given so much to him.